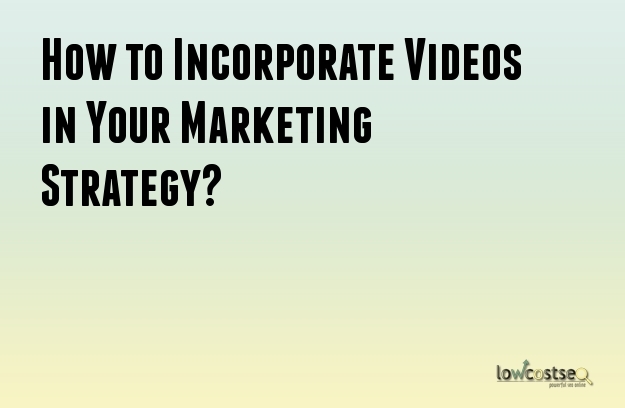 How to Incorporate Videos in Your Marketing Strategy? In the earlier times, entrepreneurs generally depended on varied traditional form of marketing technique in order to carry out their marketing campaigns successfully. These techniques were considered to be the most effective way to pass on the marketing message. However, with time things have transformed drastically. These days almost everything including business is dependent on the Internet. Yes, the Internet is a new invention that science and technology have gifted to the society. There are various types of marketing techniques that can be applied on the Internet. These innovative unique marketing techniques have outsmarted the old marketing techniques and strategies. These days, entrepreneurs are very much applying various online marketing strategies in order to have a successful marketing campaign of their business, products, and services. However, it is important to note that with the passage of time new online marketing techniques are taking over the old ones. One of the best ways to reach out to your potential customers through online marketing strategy is by passing on your marketing message with the help of videos. Yes, uploading videos is one great marketing technique that present entrepreneurs are making use of. There are various methods of uploading videos on the Internet. Are you aware of these innovative methods and techniques? Well, here is a list of them for you to have a better understanding. You will also get to know about the various platforms with the help of which you can forecast your videos. Before getting into broader details, it is important that you know about the percentage of people that really watch videos on social media and how your videos will have that extra edge to be viewed. It has been estimated that about 70 to 75 percent of the Internet traffic will be mainly for videos by the year 2017. A popular social networking site like Twitter is one platform where tweets that have got videos have about 25 to 28 percent chance to be retweeted. Landing pages that have got videos uploaded have got about 700 to 800 percent chances of a better conversion rates than the ones that do not have videos. It has been noticed that about 90 to 95 percent of viewers who read marketing messages by watching a video retain the message than the ones who get the message by reading texts. Now, let’s see the various social networking platforms where you can share your videos. There is a button known as the ‘about’ button where you can add your videos so that people are able to watch the videos on facebook. You can add or upload these videos from the library where you stock all your videos. Make sure that you include your domain name in the description of the videos. Twitter is one social media platform where you can get your targeted audience for most of the time of the day. This is one effective place where you can share your videos. So what do you need to do in order to share the videos on Twitter? When you share a video or videos on twitter you will get to see it in a media box present on the left side of your profile.